CSUN Alumna Olympia LePoint shares with attendees her experiences as a Matador in the CSUN Plaza de Sol Performance Hall. Photo by Sarah Dutton. 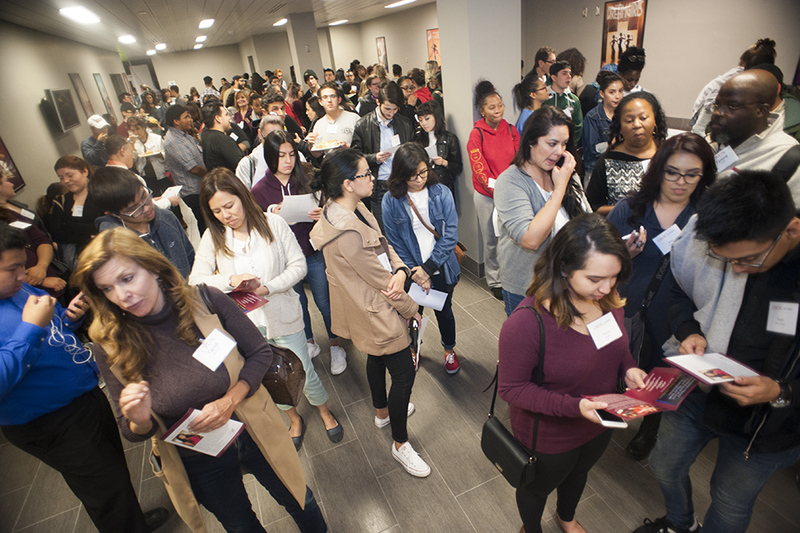 CSUN students, faculty and community members in the Plaza de Sol Performance Hall lobby. Photo by Sarah Dutton. 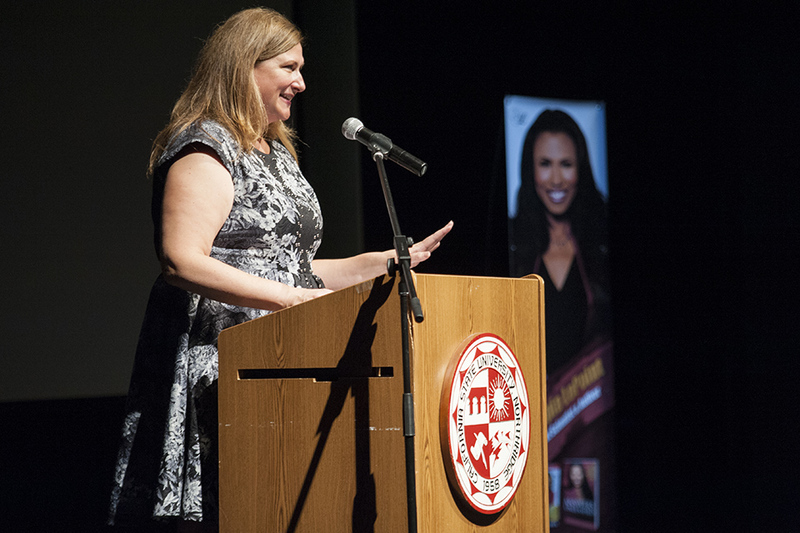 CSUN Alumni Relations project specialist and Department of Recreation and Tourism Management professor Wendy L. Yost introduced Olympia LePoint. Photo by Sarah Dutton. The 1994 Northridge earthquake shook the California State University, Northridge campus at 4:31 a.m. on Jan. 17, leaving freshman Olympia LePoint and her two younger sisters — who were visiting for the weekend — fearing for their lives. LePoint ’98 (Mathematics), M.S. ’05 (Mathematics) reflected on the harrowing experience during a recent TED-style lecture, Your Brain Master Class on campus. The lecture was sponsored by the CSUN Alumni Association. Hailed as a “Modern Day Hidden Figure” by People Magazine, LePoint contributed to the successful launch of 28 NASA space shuttle missions. 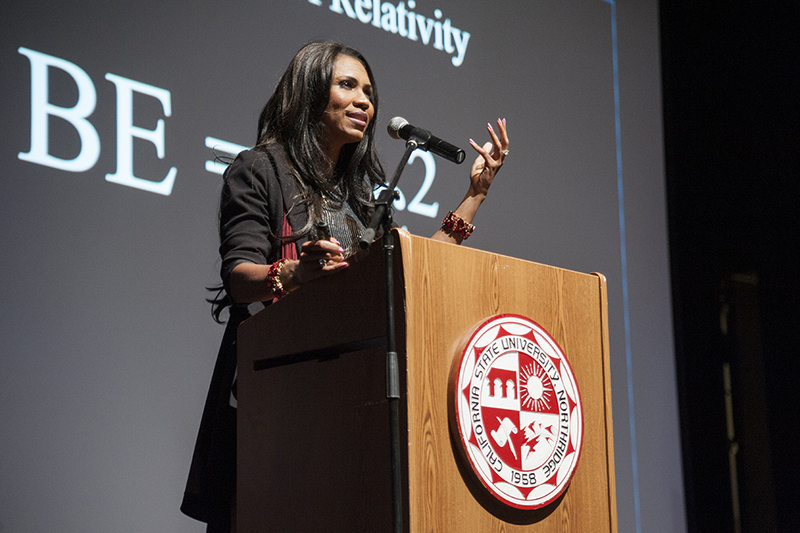 LePoint’s master class lecture focused on the effectiveness of unleashing brainpower with her “Triabrain Theory of Relativity,” which she described as using the power of science combined with faith to reshape thinking processes. A native of South Los Angeles, LePoint shared how she failed all of her math classes, from algebra to calculus, while attending LA’s Hamilton High School. When her math teacher offered extra tutoring during winter break, LePoint was the only one to show up. As a mathematics major at CSUN, LePoint used campus resources to enrich her education and help prepare for her career path. She worked as a math tutor, served as an Associated Students senator and as a New Student Orientation director. “If I could become a rocket scientist, you can do anything you want to do,” she said. Wendy Yost, CSUN Alumni Relations project specialist and a professor in the Department of Recreation and Tourism Management, introduced LePoint, reading her bio and playing a short video clip from LePoint’s website. The two were classmates at CSUN and were in the same building when the catastrophic earthquake struck. Following the informative and intimate master class, LePoint answered questions during a Q&A session and met with audience members during a book signing. Her new book, Answers Unleashed: The Science Of Unleashing Your Brain’s Power, suggests that anyone has the power to rewire the structure of their brain for genius feats. Her first book, Mathaphobia: How You Can Overcome Your Math Fears and Become a Rocket Scientist, guides readers with the knowledge to bolster mathematical abilities.